Rain was the main theme of the day at the 2017 Cycosports Nongsa Challenge in Batam on Sunday, but the downpours didn’t put a damper on the racing, with the scorching Men’s Elite contest only decided on a sprint finish up the hill to the Turi Beach Resort, where Alex Donger (MatadorRacing) pipped Kristjan Snorrason (CyclingTraining.Asia) on the line for the title. 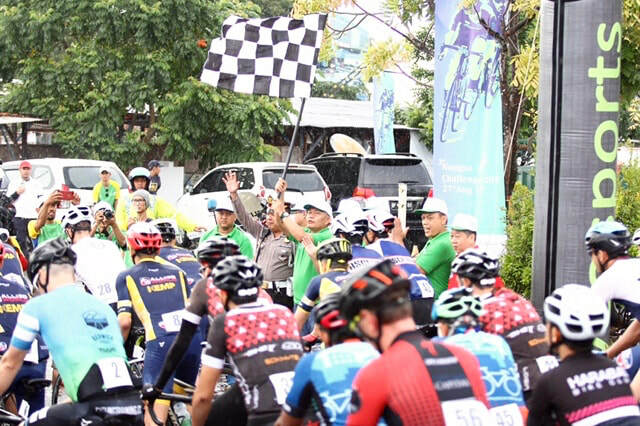 The win was sweet revenge for Donger who finished second to Snorrason in May’s Tour de Barelang, the other epic race that Cycosports stages annually on the Indonesian island of Batam, although in that race Snorrason won from a solo breakaway. As usual, the vast majority of the competitors started their day early by gathering well before dawn at Singapore’s Harbourfront Ferry Terminal to catch the specially chartered Cycosports ferry for the short trip to Batam. But as the ferry left Singapore at daybreak, the dark skies hanging over Batam were ominous. Sure enough, the rain was pelting down when the ferry docked at Batam City, but with an encouraging weather forecast the riders went about their soggy pre-race preparations. 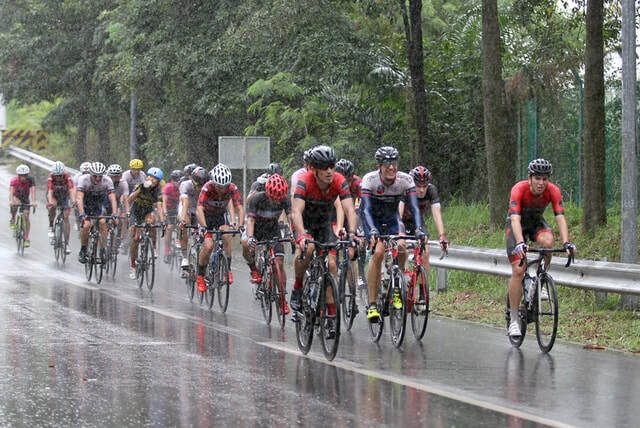 While it was still raining when Peloton No. 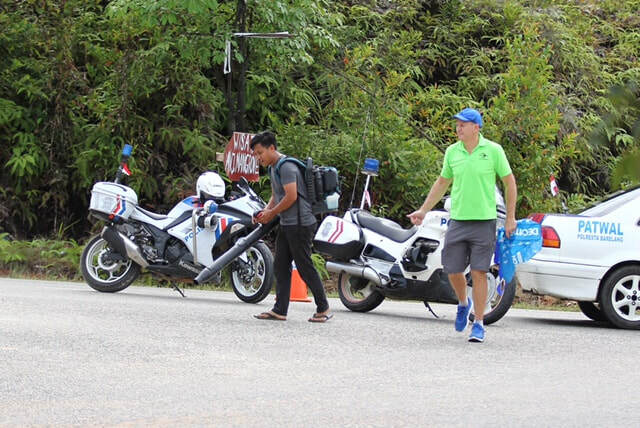 1 rolled out at 8:10am just 10 minutes behind schedule, the sun was threatening to come out as the Men’s Elite and Masters riders embarked on the 17km journey from Batam City to the Nongsa circuit and the race proper. The Nongsa Challenge is a circuit race based around a 12km loop on a peninsula jutting out of the northeastern section of Batam. 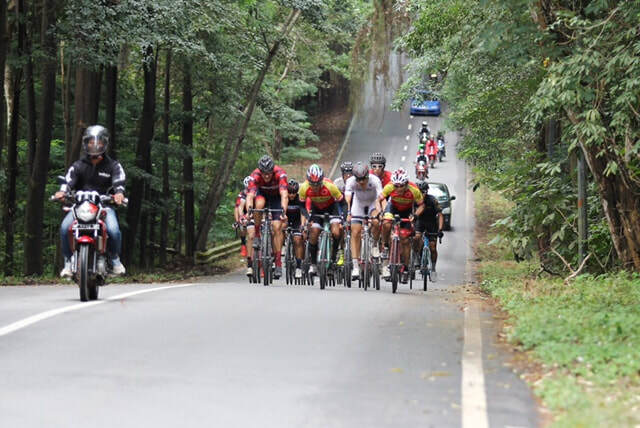 It is doubtful if a cycling race organiser could design a course better or more scenic than the already-there Nongsa circuit. The main feature of the circuit is a triple-stepped climb some 2km in length. A tricky downhill right-hander follows immediately, with the remaining 10km of road comprising of flat-to-rolling terrain. The result is a fast track that encourages aggressive racing. While the race circuit is open to motorised vehicles, the Nongsa peninsula is extremely quiet and seems a world away from the hustle and bustle of the rest of Batam. Light traffic conditions prevail, especially on a Sunday morning. For the 2017 Nongsa Challenge, Cycosports trialled a different race categorisation approach from the previous two editions of the race; instead of Cat 1, Cat and Cat3/Women Open, this time there were eight categories spread across three pelotons. The first bunch saw the Men’s Elite and Men’s Masters (35-44), while Peloton No. 2 grouped Juniors A (17-18), Men’s Super Masters (45-54), Men’s Veterans (55+) and Women’s Open. The third bunch contained the Men’s and Women’s Sports riders. Pelotons 1 and 2 faced six and three-quarters of the circuit, which added to the journey to Nongsa from Batam City and the final 1km up to the finish line at the Turi Beach Resort, gave a total distance of just over 100km. Peloton 3 raced two fewer laps of the circuit for a distance of 76km. The rain has stopped completely by time Peloton 1 hit the circuit and glimpses of the sun and blue skies saw the roads begin to dry, although with tree cover around large parts of the circuit, substantial sections remained damp. Patches of mud were also a problem but the Cycosports team did a remarkable job of clearing the worst of the dirty run-off and the circuit was safe to race on. Perhaps heartened by the change in weather fortunes, the racers hit the circuit with zeal, the fast pace proving too much for some, with quite a few rides shelled on the opening lap. Onto lap 2 and the peloton was down to around 40 riders, with sizeable contingents from teams such as Allied World Kemp Technology, Integrated Riding Racing Team, MatadorRacing, CyclingTraining.Asia, the Specialized Roval Mavericks, Anza Cycling and KGB-Sepeda Kita represented. For the next 90 minutes or so, attack and chase was the name of the game, but none of the would-be escape artists managed to get away and the big group stayed intact. That changed when the rain came back with a vengeance on the penultimate lap, with several of the more nervous bike handlers finding themselves out the back. The peloton was reduced further as the pace went up a notch or two as the race hit the last lap, but some 30 riders were still in contention as the contest entered its exciting finale. Instead of turning right at the end of Lap 7 to hit the triple climb again, the Nongsa Challenge course turns sharply left for the final 1km stretch to the finish line. But that final kilometre is split into two ramps separated by a short plunge. The first slope is only 250 metres long but at 7 percent and with riders now going full gas for the win, most notably Snorrason, the bunch was quickly shattered. The brief downhill saw a much smaller bunch regroup for the final push, but the second ramp is even steeper than the first and with legs full of lactic, the shattering effect of its 300 metres was even more spectacular. Snorrason was still at the front and looked set to make it a famous Batam double, but Donger somehow disentangled himself from a messy situation and then dug deep to catch Snorrason just before the line to take the win. The fast-moving James Loh (Integrated Riding Racing Team) just failed to catch Snorrason, but his consolation for “finishing third” was to claim the Masters title. Another Master was next across the line, Todd Sinclair (CyclingTraining.Asia). Guillaume Causse (Allied World Kemp Technology) was the last of the five riders to contest the sprint, and his reward was to take the final step on the Men’s Open podium. The rest of what had been a big group of 30 crossed the line solo or in small groups. The first of these was Kelvin Khoo (MatadorRacing), his efforts earning him third place in the Masters race. The 23-year-old Donger was delighted to take his maiden road race win in just his fourth attempt. “It's great. It's my first win in a road race so I'm sure the memory will stay with me for a long time. My teammates seemed chuffed so it's nice to see them happy too,” he said. Donger may be a relative rookie to road racing, but in time-honoured tradition the young Englishman with a background in time-trialling thanked his Matadors teammates. “I spent much of the race loitering at the back of the peloton trying to stay out of trouble. I was lucky to have my teammates buzzing around at the front. Romain Barbier was particularly strong and he's had a great season, having won a few multi-day tours. Without them I would not have arrived at the finish feeling so fresh,” he said. Despite the strong efforts of his teammates, Donger revealed he thought he was out of contention as the race entered its brutal finale. “Since I didn't know the course, I thought I had blown it. I saw Kristjan speed off up the first ramp but I was around ninth or 10th position. On the final ramp I was around sixth but I chose a bad line, got boxed in and had to hit the brakes. At that point I really thought I had blown all chances of a win so I was really surprised that I had it in the legs to power up to the line. I thought I was in for another second place. It was a fantastic mixture of delight and surprise as I crossed the line,” he said. "The circuit was good, especially under the circumstances of heavy rain. I was expecting much worse in terms of mud on the course. We should probably thanks organisers for that," Donger said, no doubt speaking for the entire body of competitors. 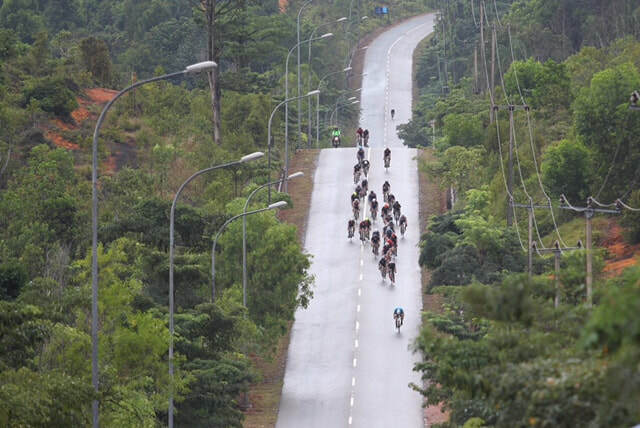 "Both Nongsa and Six Bridges (Tour de Barelang) were great fun so a big thanks to Cycosports." The racing in Peloton 2 wasn’t quite as fast as in the front bunch, but the mixture of up-and-coming teenagers, grizzled veterans and elite women combined to deliver an exciting contest. With a field of around 40 riders spread across four divisions, there were no big teams dominating the tactics. This didn’t prevent multiple attacks throughout the race, especially on the triple hill, but the bunch was not of the mind to let anything away. 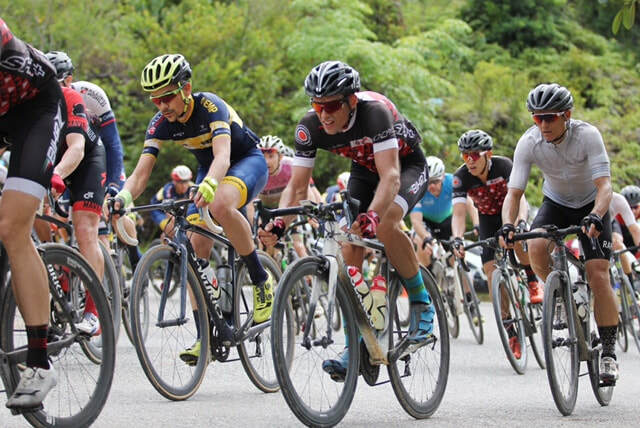 Even when two of the Juniors, Marcus Tan and Jack Grant (Specialized Roval Mavericks), escaped up the road, the old men in the Super Masters and Veterans didn’t relent and brought the youngsters back. The rain returned on the penultimate lap, but even that didn’t eat into the resolve of the bunch for a sprint finish, and so most of the field was still together as the race hit the last 4km of the contest. The pace ratcheted up in this prelude to the finale and some 25 riders screeched round the left-hander up towards the line. The wins in all four categories were still up for grabs and perhaps that played a part in the crash that took out half a dozen riders as the field spread across the road just before the final 200m of climbing. Those that stayed upright pushed on but just like in the first race, the severity of the final slope shattered the cohesion of the reduced bunch and produced a frantic and chaotic finish amid the pouring rain. One rider, Frank Reynaerts, surged clear of the rest and the Anza Cycling man duly took the Super Masters title as well as bragging results for winning the Peloton No. 2 combined contest. Next across the line but four seconds back was another Super Master, David Strooper (MatadorRacing), just pipping the youngster Tan who took the Juniors win. Fourth fastest and securing the Women’s Open title was perennial winner Serene Lee (CyclingTrainingAsia). Jason Toomey (4T2) took fifth place and with it the final spot on the Super Masters podium. Steven Wong (Anza Cycling) was next to finish and claimed the Veteran’s title. Second place in the Veterans went to Matt Sheridan (4T2) with Peter Williamson (Anza Cycling) in third. The runner-up in the Women’s Open was Wendy Yap (KGB-Sepeda Kita) with Christina Liew (Treknology 3) in third. Shu Hong Lim took second place in the Juniors contest ahead of Nicholas Long (30Forty Cycling Team). The field for the two Sports categories contained around 40 riders, but the pace at the front of this group was still high enough that the peloton had halved in size by the time the triple-hill climb had been negotiated for the first time. 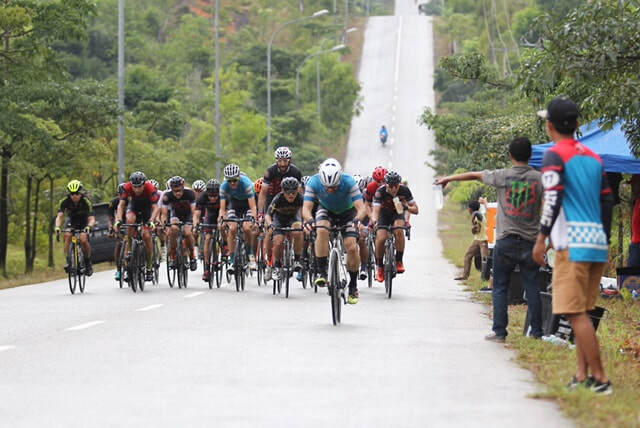 This race came down to an uphill sprint finish, with Mark Wong (Team West Coast) proving the strongest ahead of Erddiansyah Aon and Lius Aon (both Ride Brothers Tanjung Pinang). Ruth Cutaran (Team Harabas) took the Women’s Sports crown ahead of Gladys Kwok (TriEdge) and Xi Zou. Showers at the Turi Beach Resort and a sumptuous lunch awaited the weary and drenched racers before the prize-giving ceremony and bus rides back to Batam City for the ferry home. For full results, visit www.cycosports.com. 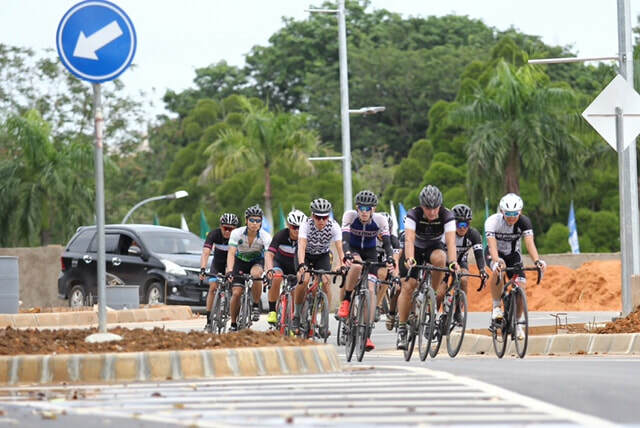 Read our race report of the 2017 Tour de Barelang (aka Batam Six Bridges) here. Photos by Ricky Wihendar. This article also appears in www.secondwindmagazine.com.